Welcome to the 2014 Trail’s End Farm CSA! After a year hiatus from the CSA we are back, hopefully better than before. It was quite a year for us. Our farm computer died just after the end of the CSA season, taking with it many files that were not backed up! Jason tore his rotator cuff in Nov. 2012 and had surgery in Dec. 2012. Rhonda gave birth to our second boy, Ezra, in Jan. 2013. We got our high tunnel assembled mid spring 2013 and grew some great tomatoes, cucumbers, and peppers with salad mix, carrots, and radishes underneath. We got a stop work order from the planning department on our tunnel and after months of persuasion finally received an ag exemption for the tunnel in the late summer. The year ended with the unexpected death of Jason’s mom killed in a head on collision in December. After all this we weren’t sure we were up for farming this year… but Jason is addicted and we enjoy farming too much. This season will look a little different as we will be starting a little later to give time for Rhonda to give birth to our first daughter who is due in the beginning of June. We currently have carrots, spinach, fava beans, and cover crop growing in the high tunnel and garlic coming up in the field. (We actually harvested some spinach this week!) We have a 5000 gallon tank collecting rainwater already and we are working on setting up more water tanks tied to the well in order to help us make it through the drought. We are also planning on increasing our walk in cooler size and improving our packing area. We have read about other CSA’s having a “weed and feed” event on their farm where members are invited to come and help with a half day of weeding and cultivation followed by a BBQ or potluck meal and would love to try one this year. 2. We are hoping to do a delivery for pickup in Westwood. There will need to be a minimum of 10 members signing up for Westwood pickup to make this work. We are looking at a Friday delivery to Westwood but the details are still not worked out. 3. Our first share will not be the first market weeks. The baby is due June 11 so our first box will be on June 20-21. 4. For a slightly higher price, we are extending the time between payments if you choose a 2-payment plan. The discounts and pricing schedules do favor early payment as one of the biggest benefits for the farm of the CSA is having a source of funding for the big expenses early in the season like seed, compost, and irrigation system repairs. When you pay early, we have less need to borrow operating funds. Our 2014 CSA weekly season will begin June 20-21 and end on October 3-4. Share Boxes will be at our farm on Friday afternoons from 5-7pm, at our market stand at the Susanville Saturday Farmer’s Market from 9 am to 11:30am, or at Westwood, place and time TBA. Empty boxes from the previous week need to be returned at the next week’s pickup. Boxes will not be available before designated times as we need the time to set up. Trade Box: Sometimes there will be a box at the pickup where members may leave items from their share they do not want. Or they may trade with an item already in the trade box that they would like more of. Membership is limited. Members will be accepted on a first come-first served basis. Priority will be given to past members until the early payment deadline on March 21. If payment is not received by the due date(s), then the next person on the waiting list will be given that slot. 2-Payment members will have their share on hold after July 21 if their second payment is not received by then. Contracts are due as soon as possible to hold your spot in the CSA, regardless of the payment option you choose. Payment options are on the following page. Members will also receive a $0.50 per dozen discount on eggs and 10% discount on chicken. An email or phone call before the payment deadlines will let us know you are interested and hold a spot for you pending payment. If you would like to pay in two payments, the price will increase by $20. Eggs by the dozen will be given 50 cent per dozen discount. Pasture Raised chicken will be given a 10% discount. _It's time to sign up for the 2012 CSA. 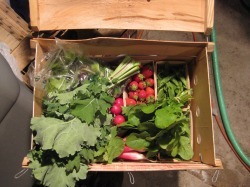 We will be packing the CSA boxes on Thursday night instead of Friday night and storing them in our walk-in cooler. This will allow us to attend the Sierra Valley Farmer’s Market which is during the day on Fridays. We have a member who is trying to organize a pickup in Westwood. There will need to be a minimum of 10 members signing up for Westwood pickup to make this work. We are looking at a Friday delivery to Westwood but the details are still not worked out. Our first share will not be the first market week. Jason is still teaching that week and is required to work Thursday attend LHS Graduation on Friday night June 1. We will still be at the first market but will have much less stress without the CSA that week. For a slightly higher price, we are extending the time between payments if you choose a 2-payment plan. The discounts and pricing schedules do favor early payment as one of the biggest benefits for the farm of the CSA is having a source of funding for the big expenses early in the season like seed, compost, and irrigation system repairs. When you pay early, we have less need to borrow operating funds. 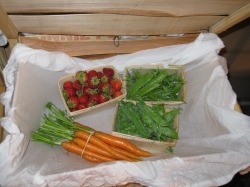 Our 2012 CSA weekly season will begin June 8-9 and end on September 28-29. Share Boxes will be at our farm on Friday afternoons from 4:30-7pm, at our market stand at the Susanville Saturday Farmer’s Market from 8:30 am to 11:30am, or at Westwood place and time TBA. Empty boxes from the previous week need to be returned at the next week’s pickup. Boxes will not be available before designated times as we need the time to set up. Trade Box: There will be a box at the pickup where members may leave items from their share they do not want. Or they may trade with an item already in the trade box that they would like more. Membership is limited. We are planning on 24 full shares. Members will be accepted on a first come-first served basis. Priority will be given to past members until the early payment deadline on Mar. 3. If payment is not received by the due date(s), then the next person on the waiting list will be given that slot. 2-Payment members will have their share on hold after July 28 if their second payment is not received by then. We are excited to announce a new season of our CSA. We are expanding and we hope you can be a part of it. If you are new to the concept of CSA, the basic idea is like a "subscription program" for vegetables. The customer pays up front at the beginning of the season, and the farmer commits to provide a "share" of vegetables each week throughout the growing season. "CSA is a relationship of mutual support and commitment between local farmers and community members who pay the farmer an annual membership fee to cover the production costs of the farm. 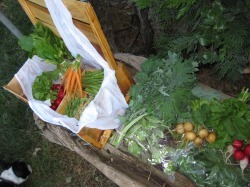 In turn, members receive a weekly share of the harvest during the local growing season. The arrangement guarantees the farmer financial support and enables many small- to moderate-scale organic and/or bio-intensive family farms to remain in business. Ultimately, CSA programs create "agriculture-supported communities" where members receive a wide variety of foods harvested at their peak of freshness, ripeness, flavor, vitamin and mineral content." If this sounds like something you are interested in, we are currently accepting members for the 2011 season. A limited number of shares are available. Priority will be given to returning members and to those who signed up first. Benefits: 10% discount on pasture raised chickens and 50¢ discount on a dozen eggs. A copy of the contract is available for download here. If you have questions or would like to sign up, you can contact us at 253-2809 or email trailsendfarm@frontiernet.net. Apparently, I missed these details in the last post. Sorry. CSA Member receive a 10% discount on Eggs by the dozen or pasture raised chickens purchased at the Farmer's Market. We are still accepting members! We still have CSA shares available! We are looking forward to a great season and would love to have you join us. Things are hopping on the farm. There are many vegetables in the ground already and many more seedlings in the greenhouse. We have extended the due date for the first payment. The first payment is now due April 24th. 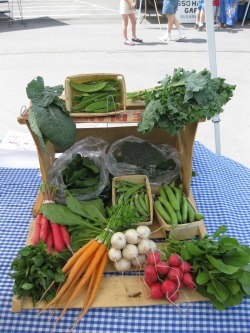 Our 2010 CSA weekly season will begin June 5 and end on September 25. There will be no shares during the weeks of July 10 and August 7 due to family events. Fall shares will be distributed once a month in October and November yet to be arranged. their share they do not want. Or they may trade with an item already in the trade box that they would like more. Membership is limited. Members will be accepted on a first come-first served basis. If payment is not received by the due date(s), then the next person on the waiting list will be given that slot. Payment is due by April 24. Either for the entire discounted amount or the first of 2 payments if the 2 payment option is chosen. Members will also receive a 10% discount on eggs and chicken at the market.